SPA an Italian automobile manufacturer, produced cars between 1906 and 1926. The company was established by Matteo Ceirano and Michele Ansaldi in Turin under the name of Societa Piemontese Automobili. The first cars were exhibited at the Esposizione di Torino. These models,designed by Ceirano, were called 28/40HP and 60/70 HP. In 1908, the company merged with FLAG (Fabbrica Ligure Automobili Genova) and the new company became Societa Ligure Piemontese Automobili. The headquarters was in Genoa while production continued in Turin. The next year a SPA racer driven by Ciuppa won the Targa Florio race. Before the World War I, there were twin, four and six cylinder cars - the biggest had a 11.536cc displacement. In 1916, both Ceirano and Ansaldi left. After the war, production was resumed with pre-war models (25/30 HP and 14/16 HP). In 1923 the company moved to Turin again. New sporting models (Tipo 23, Tipo 24 and Tipo 25) were marketed - the most progressive model had a six cylinder dohc 24 valve engine. Following to financial problems of the company, Fiat took over in 1925 and the company soon discontinued manufacturing cars in favor of commercial and military vehicles. After the World War II, Fiat resumed car production for a while but in 1947 the company was finally absorbed into Fiat. In 1899, Matteo Ceirano, along with his elder brother Giovanni Battista Ceirano (which came from the newly founded FIAT), founded the company "Fratelli Ceirano" in Turin (see story CEIRANO). In 1903, Matteo Ceirano left the company and founded "Matteo Ceirano and C", located on the same street. In 1904 Matteo Ceirano was associated with engineer Giulio Cesare Capp, and renamed his company calling it "Matteo Ceirano and C - Mark Vetture Itala," (see story ITAL) more popularly known as "Italy". Matteo Ceirano left the latter company the following year in 1905 to create, along with Michele Ansaldi (industrial who had participated in the alliance FIAT-ANSALDI), a company called "Ceirano-Ansaldi" in 1906 which led to the formation of SPA - Società Piemontese Automobilia Ansaldi Ceirano, renamed again in 1908 following the merger with FLAG as SPA-Società Ligure Piemontese Automobilia. SPA began its activities at the end of 1907 and already had 300 workers. There were cars with engines of tourism, 4 and 6 cylinders that were quickly known and accepted by the public. But they were difficult years and then came the financial problems. In 1909, the merger is consummated with FLAG - Fabbrica Automobilia Ligure Genoa (see story), which also suffered from financial problems, the owner of which (Espicanardo Cesare, head of a group of wealthy investors), took control of the Most of the shares. The administrative offices moved into the old offices of FLAG in Genoa, but production was still underway in the factory in Turin. Among his successes in competition include a victory in the Targa Florio. During the war, began production lines parallel with the construction of aircraft engines and commercial vehicles. After the War, the company changed hands again, this time into a new group of investors. The direction of the Company was moved again in February 1923 in Turin and the Company was recovered. 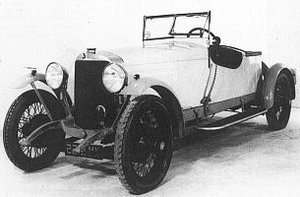 The golden years of SPA resulted in the launch of the Type 23 (4-cylinder 2724cc) in normal and sport versions, the Type 24 and Type 25 (4398cc). The owners of SPA, were also the owners of Ansaldo, and when it began to have financial problems decided to withdraw from the business. SPA was taken over by the Consortium FIAT in 1926, which ceased production of automobiles immediately and continued production of trucks up to the 40s.